I love story telling. We do much of our work with children and young people through telling the rich and varied stories of the Bible, helping them see God at work in all history and in all his world. 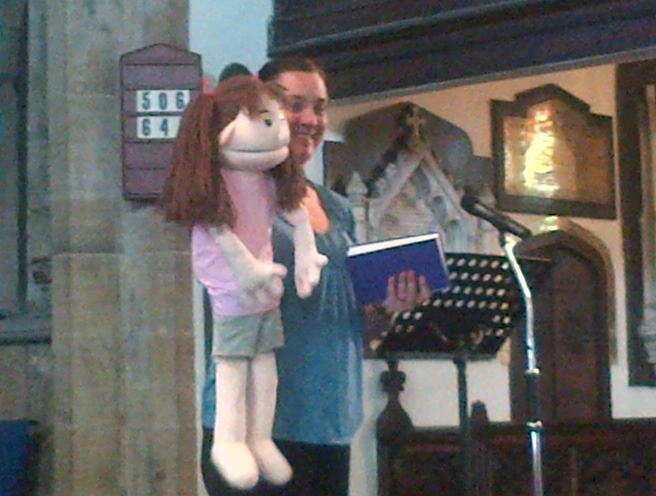 We use story to teach the Gospel and help children understand their need of a Saviour and ultimately, who that Saviour is. We use story to explain what Jesus has done for us and what a wonderful gift of grace he offers us. 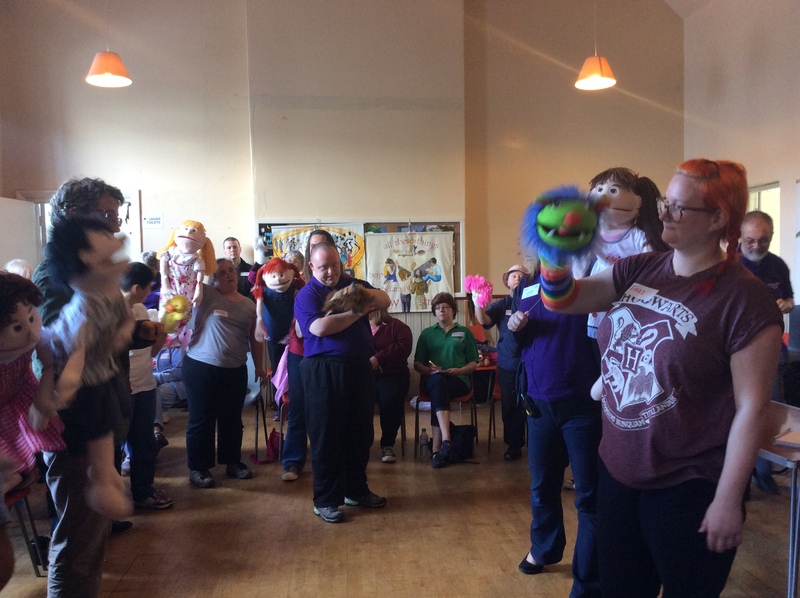 I’m going to write three posts covering sensory and interactive story telling for children (Part 1) , young people (Part 2) and then adults (Part 3) with learning disabilities. 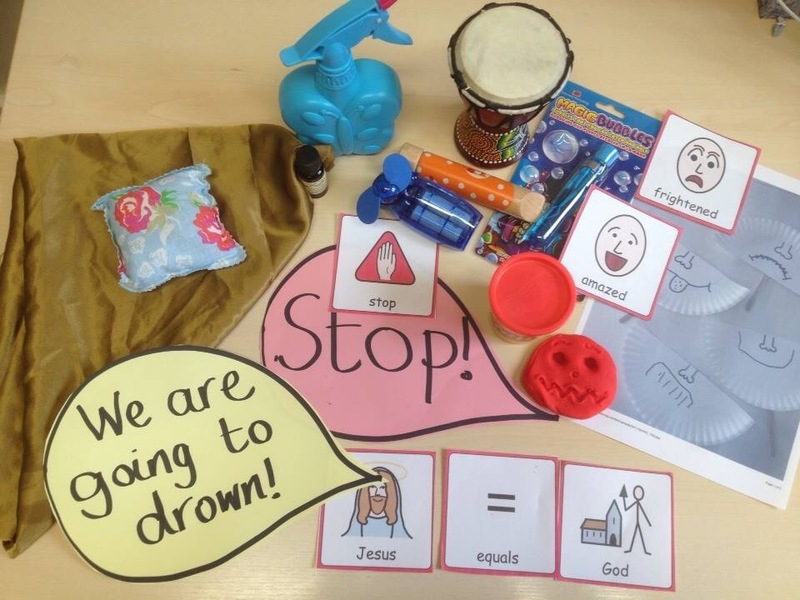 There are many different ways of telling Bible stories, this is only one and is specifically about using simple, clear language and sensory experiences that aim to bring understanding of that language. What is a sensory story? 2. He and his friends went out on a boat where it was nice and quiet. 3. A storm came. It was VERY windy, and VERY rainy. the Waves were enormous. 4. Jesus’s friends were frightened. Jesus stayed sleeping. 5. The friends woke Jesus up. “We are going to drown” they shouted. 6. Jesus stood up, put out his hand and said “STOP” to the storm. 7. The friends were amazed. Only God has power to control the weather. Use colouring, scents and tactile activities. For each of these sentences you can now choose a sensory experience that enhances the understanding of the story, rather than distracting the child from it. The sensory experiences should come out one at a time and each one put aside when you are ready to say the next sentence of the story. You can put them in order behind you or somewhere just out of reach to help with sequencing, but the focus should be on each sensory experience alone. It is at this stage you need to be mindful of any sensory sensitivities the children may have. Be careful that you don’t distress them by using something that they cannot cope with. Fortunately there are so many sensory experiences you could use that you can usually find something. I often will put them in a box or bag with a symbol or picture of the story on the front so that the children can anticipate each thing that will come out of the same place. This also helps with your own organisation! 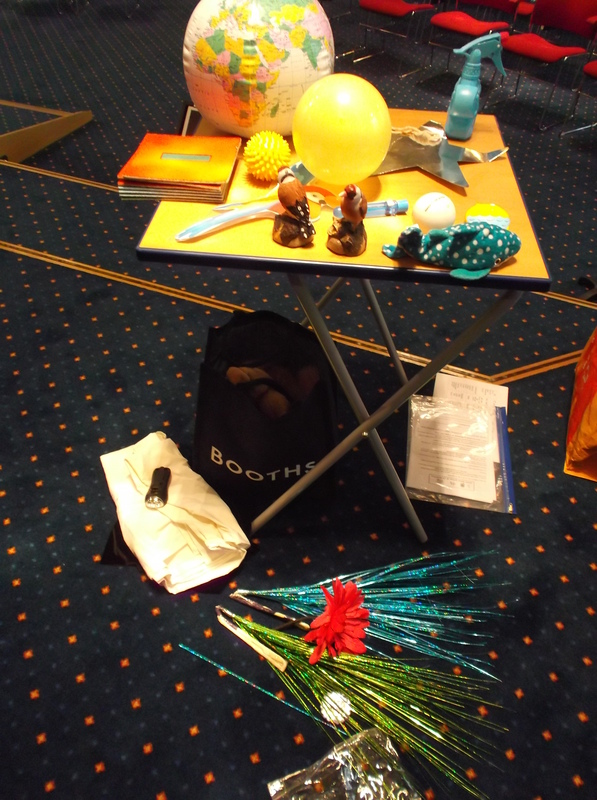 Here is the story with a few sensory ideas, chose only one or make up your own. Don’t forget to think about all your senses, generally we would use one or two at a time but throughout the story use a good variety. Be creative but try to make the sensory experience enhance the meaning of the words. Use a variety of things you have to hand or make your own. Pringle tubes make good thunder or rain sound makers. plastic bottles filled with fish, tiny boats or small beads for the sea can be swished around for the storm too. 6. Jesus stood up, put out his hand and said “STOP” to the storm. 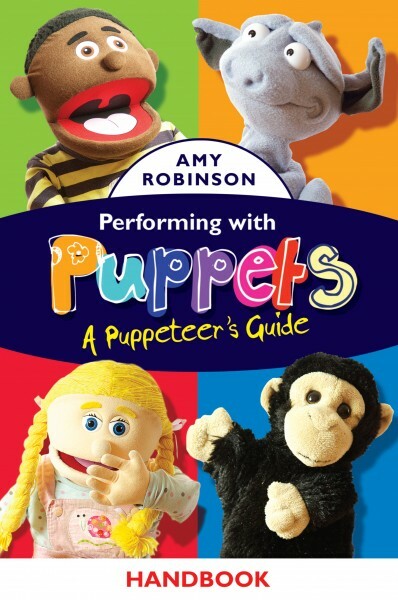 (The children can hold up their hands and say ‘stop’ or you could have a large foam hand (if you’ve got one handy! Sorry for the pun!) and again use a cardboard speech bubble if needed – they can be good for when you’ve to the children to sequence or go over the story again). Obviously planning a Sensory Bible Story relies on someone telling you what story is going to be told in your Children’s session beforehand. One of the greatest obstacles to supporting children with additional needs in churches, is communication between leaders and helpers. Once you know and get used to telling stories in this way you will find it easier and easier to do. My advice, identify your main teaching point in a sentence first and then don’t get bogged down in detail. Children can listen to these stories in other ways and probably will throughout their childhood and so the layers of detail will build gradually. Try it! And then post your story in the comments on here, or send it to me by email includedbygace@talktalk.net and we can share our ideas with each other. 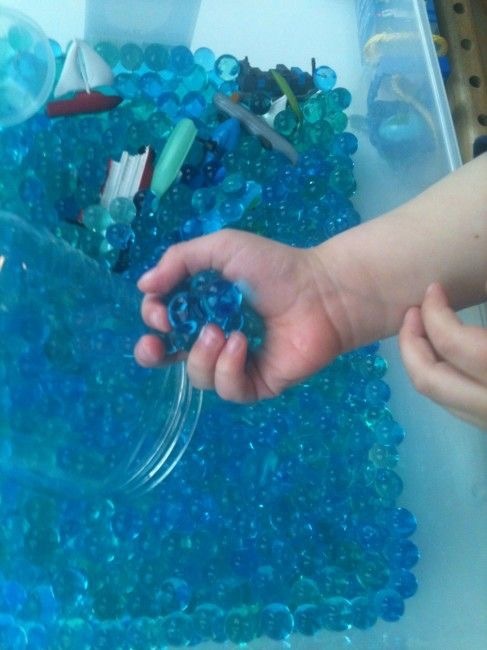 Don’t forget to take pictures of your sensory experiences and have fun! 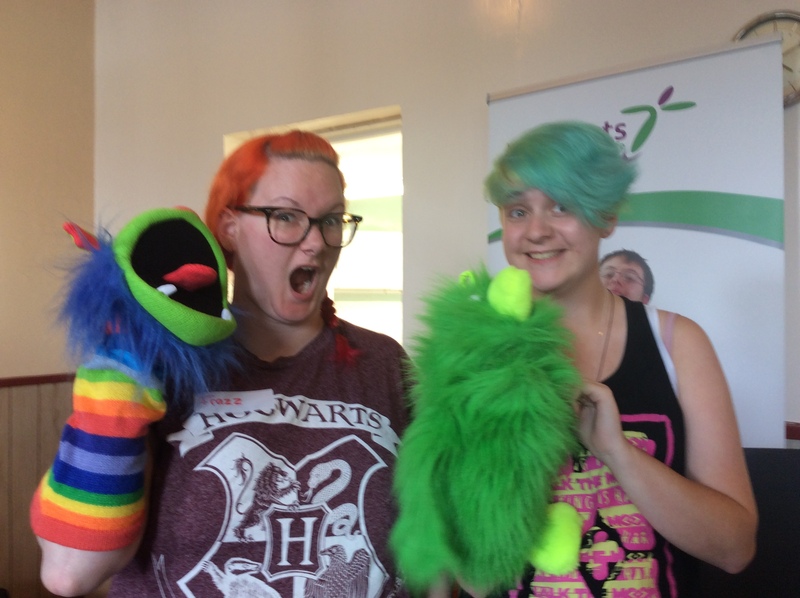 ‘Talking Puppets’ and ‘Dancing Puppets’ Me and Karen the signer. Sio and Frazz my two assistants and our performance to the group. The guests having a go. What a great workshop we had. Everyone engrossed in activity. Hope you enjoyed our pictures. That’s the first day done! I am relieved…have learned some things…and found it a fabulous experience. I didn’t mess up my actions or speaking parts and watching the whole team doing their roles was like watching a ‘well-oiled machine’! 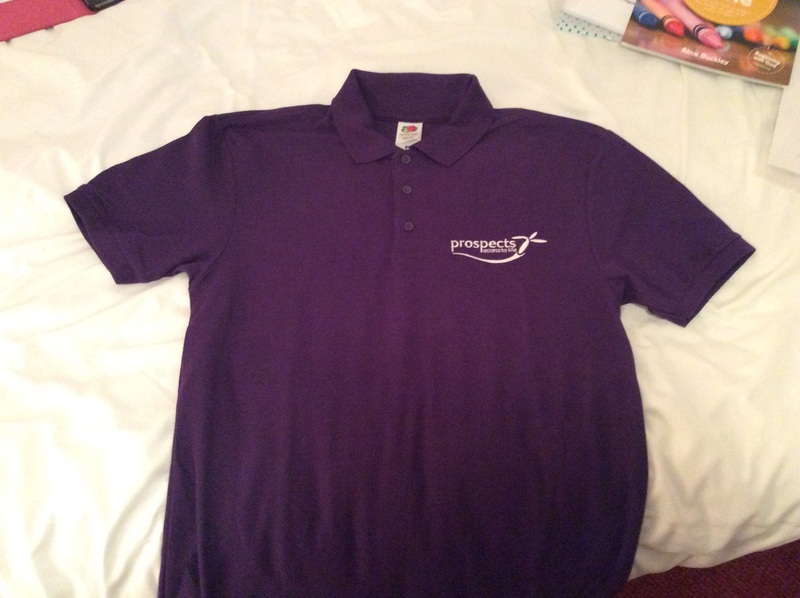 I am a proud wearer of THE PURPLE SHIRT. There is Andrew, keeping us all on task (ish) and who has planned, organised and brought everything we could ever need (except arm bands) and has a plan for any eventuality. He’s like Doctor Who…I’m his assistant…. The music team – John, Janet, Agnes and Susan. wonderful sounds from keyboard, clarinet, saxophone and drums. I particularly appreciate how John went at a pace slow enough for all the guests to keep up with the signing and singing. This is a really important and considerate aspect of making the worship accessible to all. Karen, our signer. She’s fascinating to watch and enabled those who couldn’t keep up with the verbal information and those who could not hear to access the meeting. She even coped with my ad-libbing when I threw in some quick testimony! 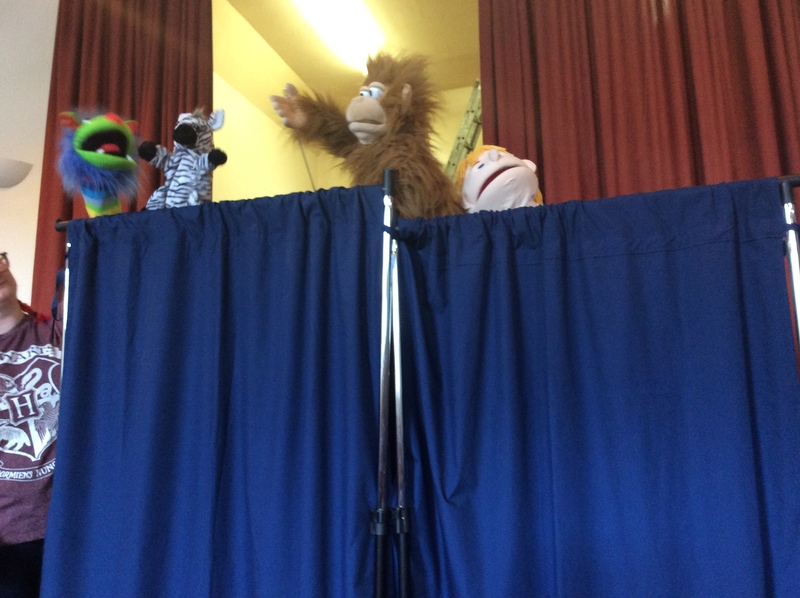 Christine, Audrey, Nigel and Steven – the welcome and bookstall team. I noticed that no-one came in without being warmly welcomed, old friends hugged and delighted in and people who were new to the meetings were looked after individually. The lovely Anne who provides us with all the brews we need. She is my hero after not being bothered at all that I’d asked for a China mug instead of a polystyrene cup because polystyrene goes through my teeth. She is the lady who draws a smiley face on the bottom of the [polystyrene] cups so you share a smile with those around you every time you lift up your cup to drink! And finally there is Gill, who never stopped talking, supporting and helping anyone who needed it all through the session, and managed to be the official photographer as well. The quote from 2 Corinthians 8 seems to illustrate just what is going on here. 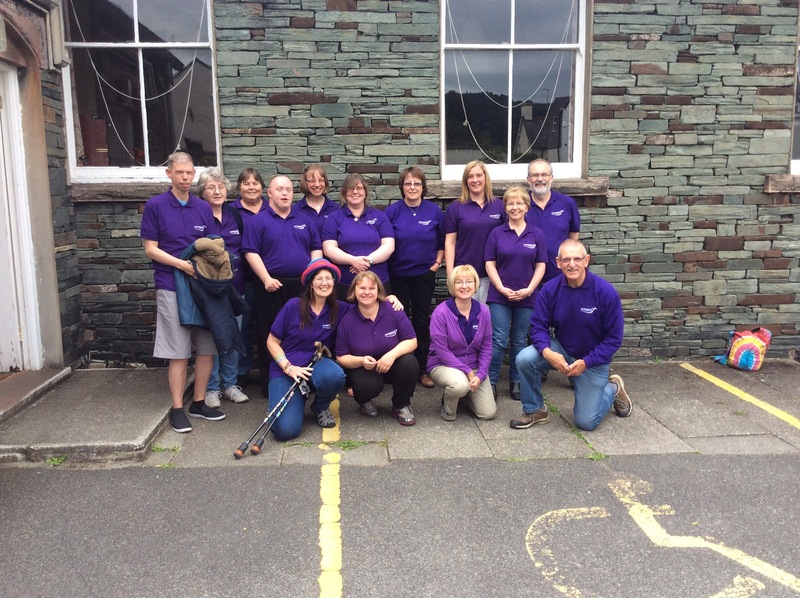 A variety of people, from different churches, with different skills, experiences but with one heart for people with learning disabilities to access the life God promises through Jesus. All we want to do is bring honour to Christ…please pray that we will. 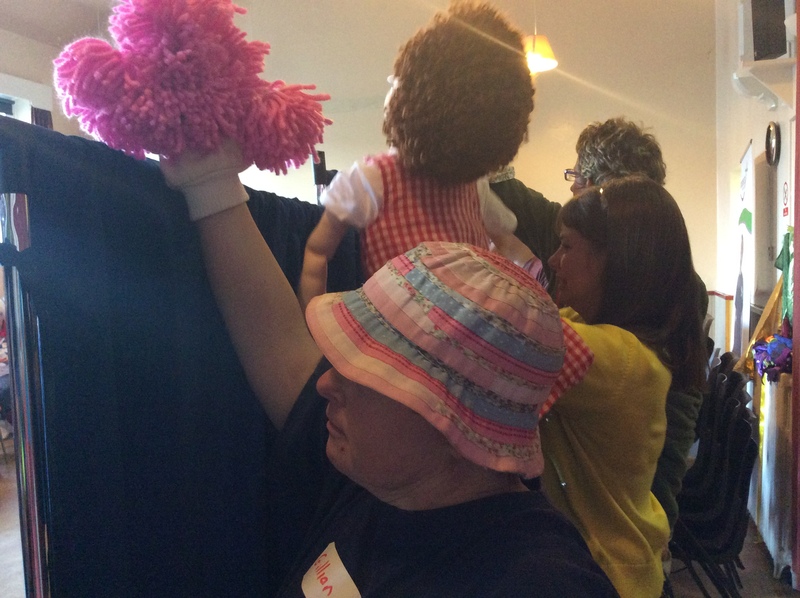 I’m writing this from the Hand in Hand Conference in Eastbourne where I’ve come to deliver two sessions about making the Bible accessible for children with learning disabilties and autism in churches. My initial response is to say that inclusion means having the same opportunities as everyone else. It is better for social inclusion for a child with learning disabilities to be with their peers. It is also good for the peers of the child with learning disabilties to learn how to build friendship and include those who may see and experience the world differently to them. Relationship is two-way. Relationship is sometimes not easy. Relationship may take some effort. But relationships that are two-way, where both learn ways of building that friendship can be wonderful. Children with learning disabilties and with autism need peers that can include them, and adults need to facilitate that. Especially in the church. 1. Talk to the parents, ask them what their child likes and what works for them. Find out all the things the child likes. 2. An hours training about what autism/ learning disabilty is for adults involved. (A similar session aimed at the children can be done as well) Parents or the child’s teacher might do this for you. 3. Simple visual structure so that they child knows what is happening and in what order. (A visual timetable) Include some of their favourite activities and if you can find Bible related versions of these, great. E.g. Bible jigsaws, the brick Bible Lego pictures. 4. Look at simplified versions of the main teaching session. Think of one sentence you could focus on. Use visual pictures to sequence a story. Let them take home one sentence or Bible verse to focus on. There are lots more things you can do. I have put my Eastbourne slides and resource list on my website (www.reachoutasc.com) so do take a look under the “churches” tab. The aim should be to establish what does work and them move it into the main group – and the peers of the child themselves should be involved in the inclusion. I have pondered the same question with our adult group too. Why have we set up a separate group in our church? One of the reasons is that Sunday Church has been inaccessible for a lot of our group. 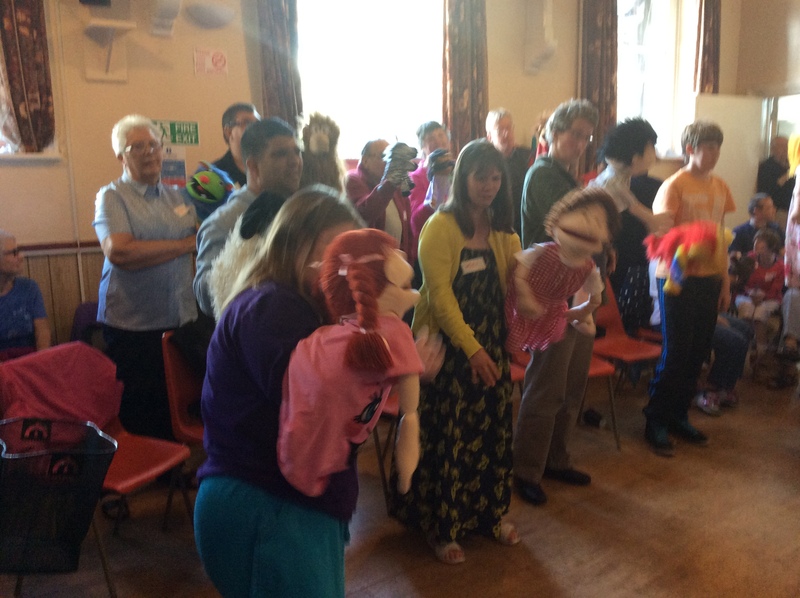 For many of the reasons I have discussed on this blog, there are language, sensory, physical and cognitive barriers in the main church service. Our aim IS to have fully inclusive church, but just as there are midweek groups for ladies, men, the more mature, children’s groups and so on, the Good News Group is a focussed group where people with learning disabilties can come and meet other people like them, they can have teaching and nurturing that is built around their needs and where the pace and communication is tailored totally to being as accessible as it can be. I can say that the Good News Group is fully church to me too. We work as a congregation, serving one another, finding our gifts and developing them and knowing one another so well that we carry each other’s burdens, pray and praise together. We run our ‘service’ part of the evening like a regular church service. We do this because ultimately we want to draw our members into the main church and allow them to feel familiar, comfortable and that they understand some of it. Our church will need to play its part and be supportive and welcoming. It is. Our ministers preach with pictures to illustrate their sermons a lot of the time. This makes Sunday church more accessible for our members. We have a long way to go but we are not saying “we can’t”. We might say “We don’t know how?” but I think God can work with that. The same is with your children with learning disabilties. Work with them and their families to make them feel safe at church. Then work to include them. Then work to disciple them and show them that with God there are no limits. Remember all the other children need to be part of the inclusion process. If you think you don’t know how, then that’s okay. Just don’t say “we can’t”. You do not know the seeds you plant? Leyland Brass Band were amazing last night. 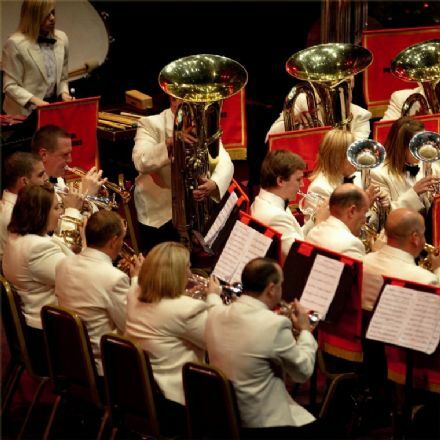 A world class brass band who happen to come from our town and doing a concert in our church. I never thought I would love brass bands so much, but then I never thought our 15 year old son would be playing trombone in another local brass band, either. It was at primary school when a brass playing headteacher arranged for the whole year group to have free brass lessons for a year. The instruments were given out by size, so being one of the taller ones, our son got a trombone. A seed was planted that was watered and nurtured in him and still amazes us, his parents who are not musical at all. The same sort of thing happened when I was a girl. It wasn’t music that someone planted into my life, but church. An elderly lady took my best friend to Sunday School with her every week. One week I was playing outside my house and she asked if I’d like to go too. Like the Pied Piper, she walked a long route to church, collecting various children, about 5 or 6 each week, and took them to church. None of our parents or siblings were interested in going and so, if she hadn’t have planted those seeds, I would have not have loved the Bible stories and Wesleyan hymns that still are the foundation of my faith. In our ministry to adults with learning disabilities we planted cress seeds last week. Some of the members came back this week very excited that their seeds were growing. We want the seeds of the gospel to grow in their lives too. We don’t always know what they already know. 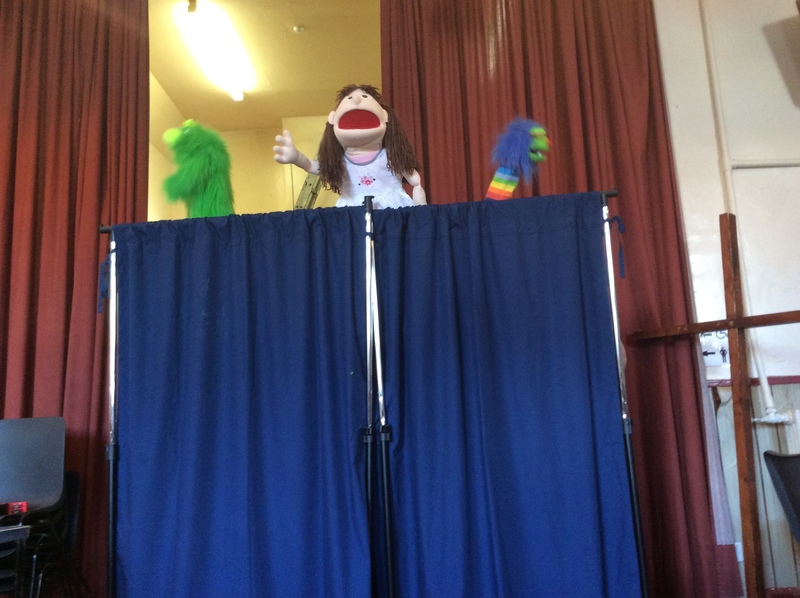 Some have been to church with their families and tell us about their faith (such as Liz who wrote a blog post for us – https://includedbygrace.wordpress.com/2014/10/23/what-one-member-thinks-of-the-good-news-group/ ) Others are unable to tell us and others we know have never been to church before coming to our group. A retired church leader once said to me “Why bother teaching the Bible to people with learning disabilities when they have the understanding of a three year old?” … after quickly composing myself, I forgave him his ignorance (we are all ignorant until God open’s our eyes) and talked to him about how this was a wrong assumption and asked him would he teach the Bible to a 3 year old. He said yes, but not all of it as they couldn’t understand. But for the fact that it is a completely wrong assumption, we talked about the power of God’s word and how we cannot limit it’s power by assuming someone can’t understand it. 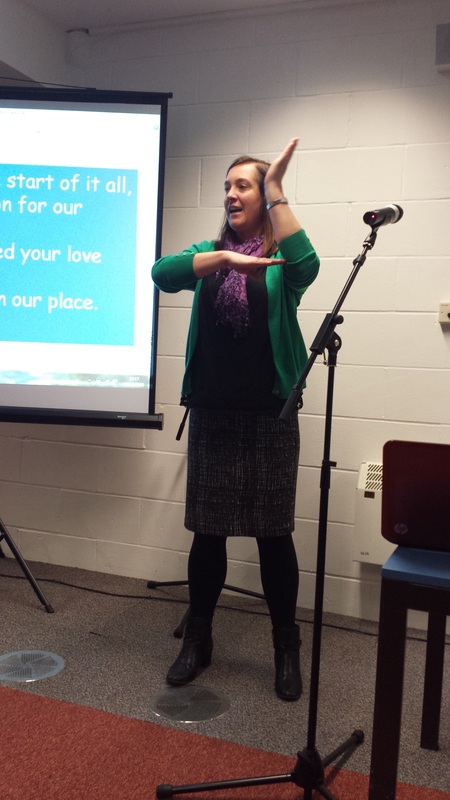 It lead very well into the session I was delivering about how to communicate the Bible in accessible ways!! Singing and Signing “Come and join the celebration”. The Good News Group’s Christmas service was amazing! 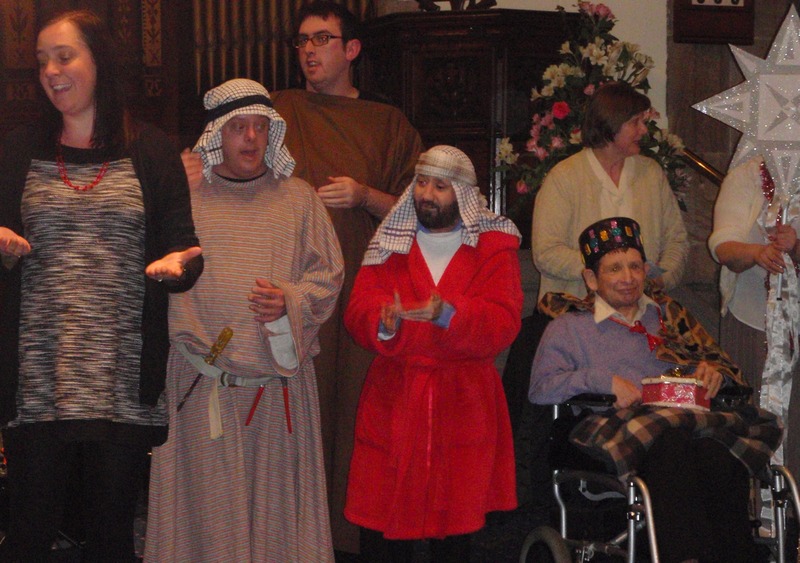 We had lots of visitors and the members told the story of Jesus’s birth together, everyone doing their part so well. 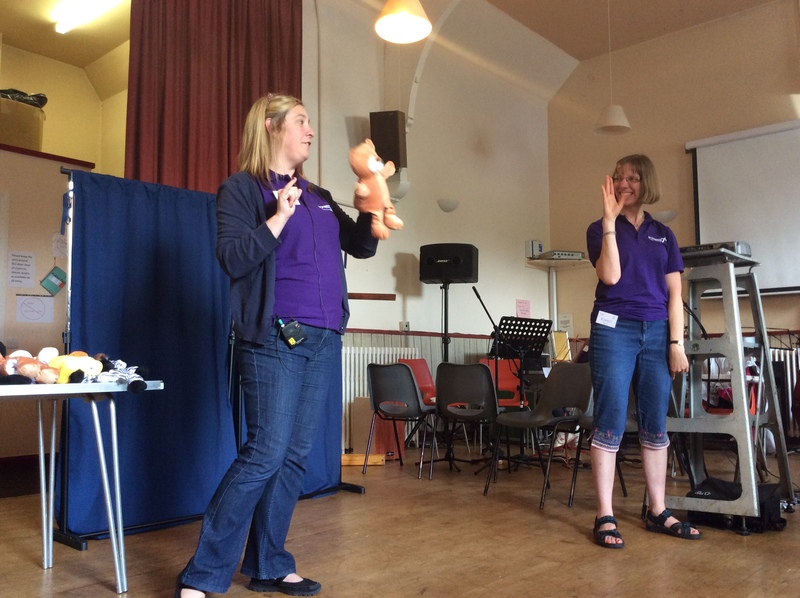 We were blessed to have the minister from our sister church at Buckshaw village, Who did a great talk linking it all together with the message that Jesus the baby grew to be the man who died for us on the cross….You should have been there! This term we head back into the New Testament and are going to look at some parables we haven’t covered before, except one. As always we have chosen a main point for each session and all our teaching is about who Jesus is and why he came. Jesus often used parables in his teaching. He taught them in a way which people of the day could understand. Jesus used terms and pictures which his hearers would have been familiar with. His hearers would often be captivated by the parables and would then discover that they had been about themselves. So they are just as relevant to us today because they both reveal and conceal truths about God and ourselves. There are 5 sessions so, we are going to look at 5 parables. They are, THE SOWER, THE WICKED TENANTS, THE GOOD SAMARITAN, THE WEEDS, THE WEDDING FEAST. 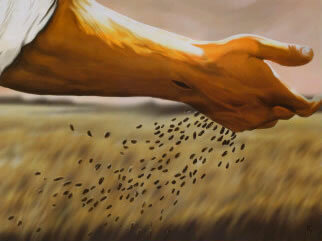 Jan 14th The Parable of the Sower (Mt 13:3-23) Main Teaching Point: People treat the Good News of Jesus in different ways. Jan21st The Parable of the Wicked Tenants (Mt 21:33-41) Main Teaching Point : We can’t share in God’s promises unless we obey Him. Jan 28th The Parable of the Good Samaritan (Lk 10:30-37) Main Teaching Point : Our love for God is shown by how we treat each other. Feb 4th The Parable of the Weeds (Mt 13:24-30 & 36-43) Main Teaching Point : God will, one day separate the people of the world. Feb 11th The Parable of the Wedding Feast (Mt 22:2-14) Main Teaching Point : It’s foolish to refuse God’s invitation. 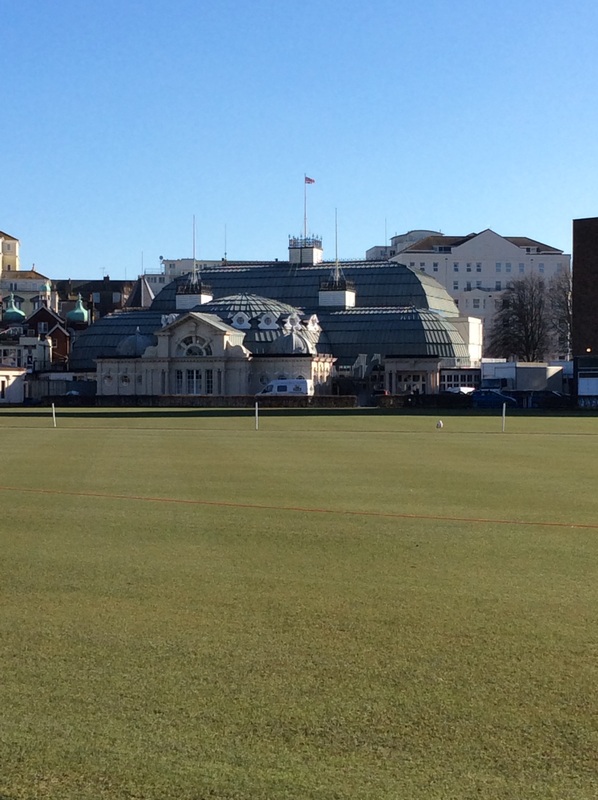 We are looking forward to this term and can’t wait to see our members after the 3 week break. 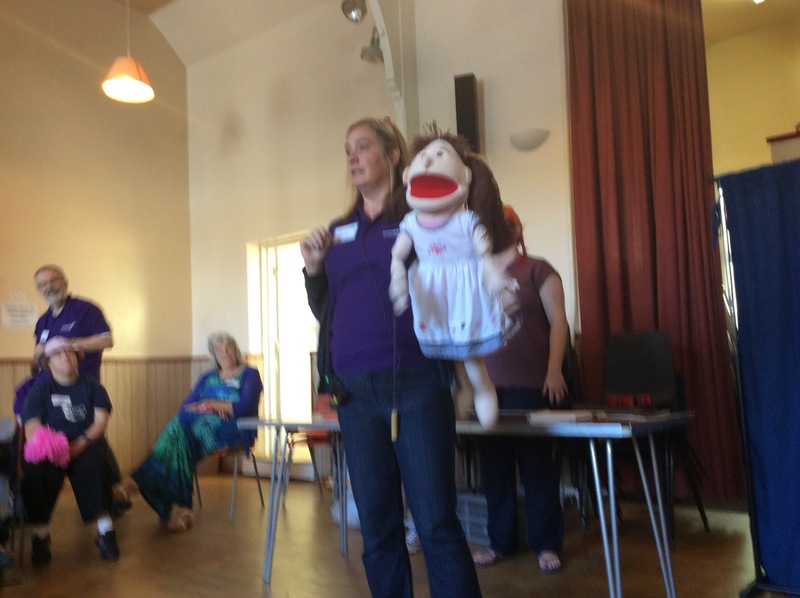 http://www.handinhandconference.com/conferences-training/2015-timetable/ – if you are there and have read my blog – please do come and say hello! Did you watch “Call the Midwife” over the Christmas break? For those of you who didn’t, it’s a drama set in the 1950s and 60s about midwives in the East End of London. This Christmas episode focussed on a group of unmarried mothers in a mother and baby ‘home’. It was a bit (well, a lot) sanitised in the programme but reminded me of the way unmarried and pregnant girls used to be treated. Their babies were often taken from them (whether they wanted it or not) and we can only imagine the effect on a whole hidden layer of our society – the mothers and the children, still alive and whose lives were forever changed by the decisions that were made. My own grandmother was an unmarried mother in the 1930s. She had a terrible time as the family outcast, but the kindness of her sister and later reconciliation with her parents enabled her to bring up my dad as a single mum. No wonder she was always such a fiercely determined woman! Yes, things changed in society in the 1960s and 1970s but there are centuries of ill treatment and children being abandoned to overcome. History is full of the illegitimate children of kings, but so many ordinary people must have been in the same situation, outcasts from the start. The same attitudes went for those who were born with disabilities. So many were outcasts and later in history shut away in large institutions. Some families bravely kept them at home, but education and employment were hardly options for these children. 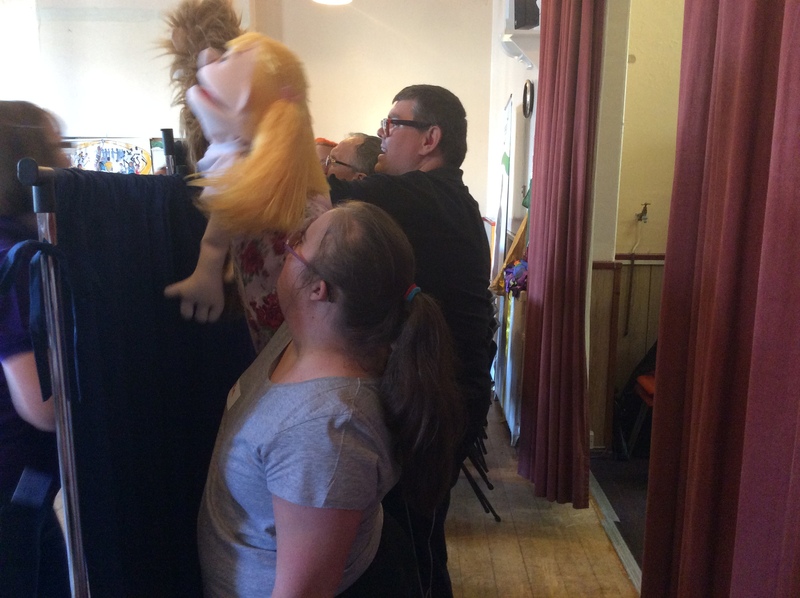 Education and inclusion for people with learning disabilities, is a rather new concept. In history we read about the ‘village idiot’ and the Victorian ‘asylums’, of homeless and neglected people with little opportunity in life but to rely on the charity of others. Life expectancy was low for many people with learning and other disabilities. Are you glad that you live in these times. We have an imperfect but much improved education system. It is enshrined in law that a broad and balanced education is a right for all. We have social and national health services and community living. There are some opportunities for employment. Oh yes…there is far to go and much to complain about…but what if we start from a place of gratitude. What we do have is a blessing and we can build upon the work of others and make it better in the future. In our churches, communities and towns are people with disabilities in their 40s, 50s, 60s and older who were born and raised when times were very different. 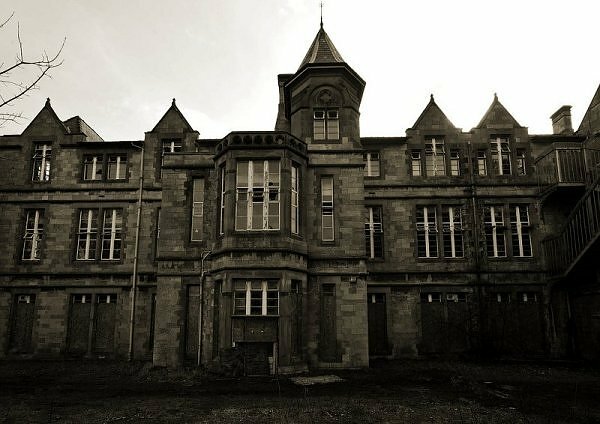 In our group we have at least one person who grew up in a large institution… a large ‘metal’ hospital. (As it was known). Now living in the community and well integrated into ordinary life, it is easy to forget how this early experience might have shaped his life. 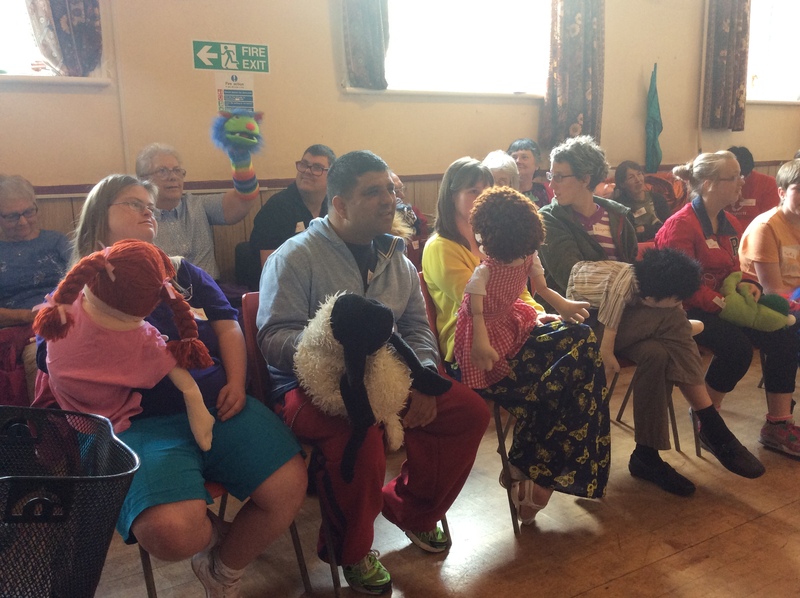 Do we take the time to ask sensitively about the early lives of the people with learning and other disabilities in our churches? it is easy to assume that they had schooling and support when they were younger…and maybe they did…but asking them about it might reveal some very interesting insights into the way they have been treated and brought up. And be careful…we need to be very sensitive to safeguarding and respecting privacy. Did you know that if an adult with disabilities reveals abuse or accusation to you, then it is their right to report it OR NOT? This is the difference between adults and children, even if they are vulnerable. I can cover this issue in another post if people are interested. If we are to minister to the whole person and disciple them, then we do need to be aware of where they have come from. I know from my own experience how Jesus ministers to the deepest and most vulnerable parts and heals what has hurt me or made me think wrongly. People who have learning disabilities and maybe don’t have the words to say or work out what they need healing for, may be able to tell you about their childhood or early experiences. A parent or carer may know some things that can help. Then we must pray. Only Jesus can tell us where to be sensitive and where to challenge. Only Jesus knows each of us and all we have been through. He knows what has shaped us for good or ill, and can heal….oh…he can heal…and make us whole in spirit. It is how we are disciple and how we grow. Praise God that none of us are different or excluded from this. 3 Praise be to the God and Father of our Lord Jesus Christ. God has great mercy, and because of his mercy he gave us a new life. This new life brings us a living hope through Jesus Christ’s resurrection from death. 4 Now we wait to receive the blessings God has for his children. These blessings are kept for you in heaven. They cannot be ruined or be destroyed or lose their beauty. 5 God’s power protects you through your faith, and it keeps you safe until your salvation comes. That salvation is ready to be given to you at the end of time. 6 I know the thought of that is exciting, even if you must suffer through different kinds of troubles for a short time now. 7 These troubles test your faith and prove that it is pure. And such faith is worth more than gold. Gold can be proved to be pure by fire, but gold will ruin. When your faith is proven to be pure, the result will be praise and glory and honor when Jesus Christ comes. 8 You have not seen Christ, but still you love him. You can’t see him now, but you believe in him. You are filled with a wonderful and heavenly joy that cannot be explained. 9 Your faith has a goal, and you are reaching that goal—your salvation.